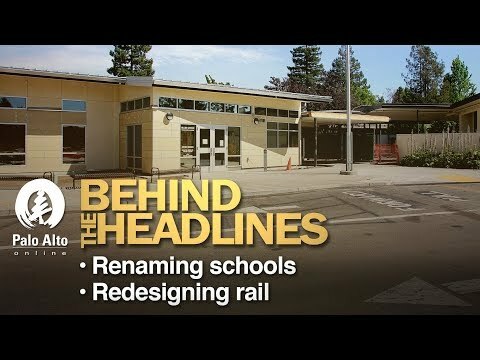 On this week's "Behind the Headlines," Palo Alto Weekly journalists provide updates on efforts to rename two Palo Alto middle schools and to separate the rail corridor from local streets. To jump to a specific topic, open the description box below the video in YouTube and click on the time stamp. If Palo Alto *Has to rename the 2 schools Jordan & Terman, why not just keep the *singular names Jordan & Terman? Otherwise I would vote for the geographical names, "Redwood Grove" for Jordan & "Adobe Creek" for Terman which are listed as one of the 7 choices they have narrowed them down to. I favor the renaming of the school after Fred Yamamoto. Story of Internment: Fred Yamamoto from Paly’s Verde. Web Link. His story resembling many to my husband’s late dad. My husband’s dad was in the US Army before WWII. He was never drafted into the Japanese internment camp but his parents and his brother did. For the same reason, the family was parted different ways. My son was a Paly 2013, a 4th generation Japanese American. He went to school from K-12 at PAUSD. Fred Yamamoto was a Paly graduate, put into the internment camp, served in WWII and died at war. For selfish reasons, I like people to remember this piece of history, so history does not repeat itself. Fred Yamamoto is a symbolic symbol in remembering this piece of history. Many of these detailed history was not included in our children’s history text book. May be in the supplementary text books. Internment of Japanese Americans. Web Link. Same with the history or story behind the Chinese Exclusion Acts. Web Link That need to change. Thank you for the committee to recognize Fred Yamamoto as a young hero of Paly and share with us his short life of 26. I salute to your effort at your selection. There are many in the community that will come for a discussion perhaps to oppose such recommendation. Please come to voice your opinion or write to your board at board@pausd.org. Don’t punish Fred Yamamoto because of his last name resemblance of others. Don’t punish Fred Yamamoto because he is Japanese American. I see this as an opportunity to lay down history on the ground. Final decision will be made at the next PAUSD board meeting on March 27 6:30pm-10pm. Whatever the result is, I respect the committee’s effort and accept the Board’s decision respectfully. After discussion, please move on with your executive decisions and don’t let this stop you from attending to more important things in your agenda.